Now if you didn't know it by now, we are huge Disney fans in the Hazelden household, well if you don't count Daddy Hazelden that is!! 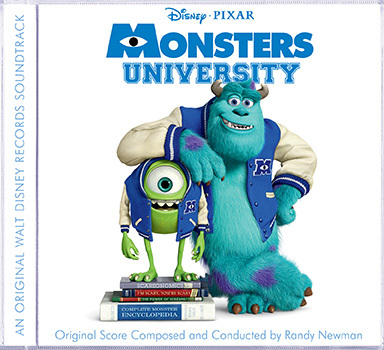 So when I was offered the chance to review the Monsters University Soundtrack I said a big fat YES. Monsters University is the newest film from Disney-Pixar, coming to a cinema near you this Summer. The director, Dan Scanlon, said that he really wanted to capture the "college feel" in Monsters University and of the course the music was a really big part of that. To convey a fun, freewheeling college atmosphere, Scanlon included musicians Axwell and Sebastian Ingrosso (of swedish house mafia) on the soundtrack. I love this CD, all the music is composed and conducted by the wonderful Randy Newman. The music really is his typical style which I think a lot of us have come to love from films like the original Monster Inc and Toy Story. It really brings the various scenes of the film to life without actually having to watch it. Now this isn't your typical "soundtrack" in my opinion, it is more of a "score" because there is actually only one song on the album with lyrics and that is the final song on the CD, this however doesn't take away from the brilliance of the music. I think because there different tempo songs that portray different emotions, it really keeps you interested. 15. Randy Newman - Did You Do This? It is funny actually, the kids and I all had the same favourite song, Scare Pig, I think maybe because it was a bit more rocky with a faster pace?? I think Newman made the music really stand out by adding in the drums and the wonderful composer also said that he incorporated concert band music to really exemplify the feeling of being in school and I have to say I really do think he achieved this!! Available now, in digital release only, this soundtrack is a great way to introduce classical sounds to your children, keeping it fun and entertaining, it is one for all of the family to listen to, it is just under an hour long, definitely worth the money you pay. Disclaimer : I was sent a a copy of this soundtrack to download free of charge to review however all thoughts and opinions are my own.